You might have noticed the updates to the Chase Ultimate Rewards travel portal that began rolling out earlier this year for some cardholders. And now, the Chase portal is powered by Expedia for all Chase Ultimate Rewards cards, including the Chase Sapphire Preferred Card, Chase Sapphire Reserve, and Ink Business Preferred Credit Card. Things are a little different! On the surface, having Expedia driving the portal might not matter much to you, or you might not even notice. But there are some positive and negative changes as a result of this update that you’ll want to know about. 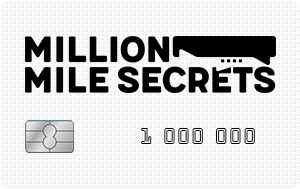 After all, we all want to make the best use of our Chase Ultimate Rewards points to get as much value as possible! I’ll share the pros and cons of having Expedia run the Chase Ultimate Rewards travel portal. And why redeeming Chase Ultimate Rewards points through the portal is still a good deal for most. You’ll often get the most value by transferring your Chase Ultimate Rewards points to airline and hotel partners like United Airlines and Hyatt. But in some cases, you’ll actually pay fewer points by booking through the portal instead of transferring to a partner for an award. So many folks prefer to simply redeem their Chase Ultimate Rewards for travel through the Chase Travel Portal and get a value of 1 to 1.5 cents per point depending on which credit card(s) they have. And if you’re new to miles and points, we recommend you start by applying for Chase cards first due to their strict 5/24 rule. 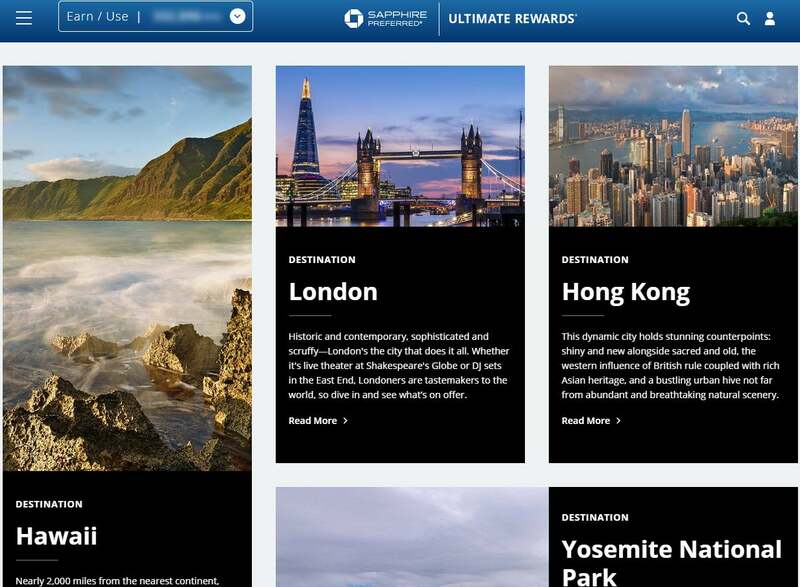 Here’s what to expect now that Expedia is driving the Chase Ultimate Rewards travel portal. 1. More Available Hotels = More Choices! 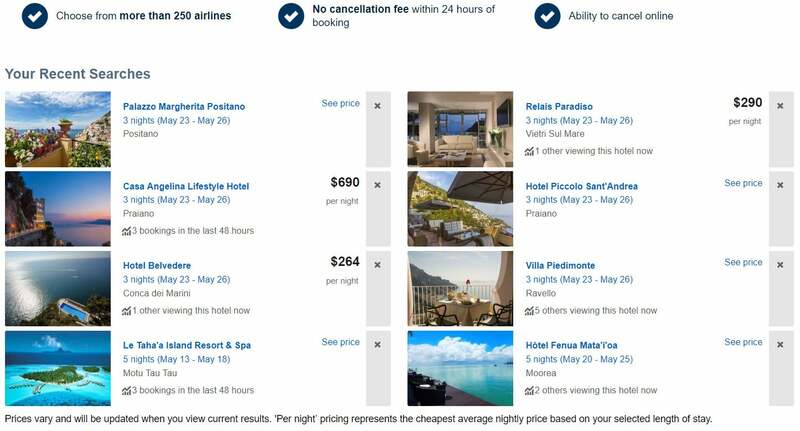 One of the primary “wins” as a result of this change is the fact that Expedia has access to far more hotels than were previously available in the Chase Ultimate Rewards travel portal. So your Ultimate Rewards points are now even more flexible because you can redeem them at more locations. 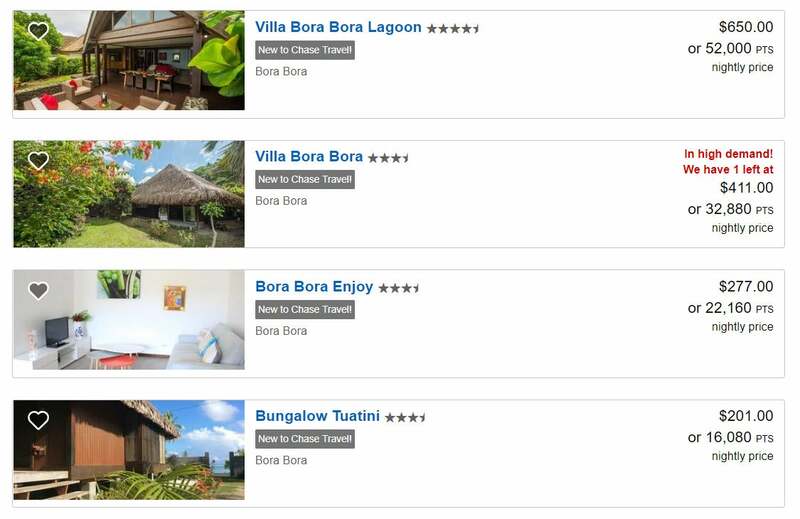 For example, the previous Chase Ultimate Rewards portal only displayed 10 to 15 hotel options in Bora Bora when doing a quick search. But the new Expedia-powered Ultimate Rewards portal shows ~42 properties available for booking! That’s a significant increase, and more options for hotel bookings are always welcome. Note: When searching for hotels, you might even notice a “New to Chase Travel” flag which shows the addition of new hotels. Often these new hotels are typically smaller, more boutique properties, so you’re not limited to just big-name chain locations. Even though more hotels are now listed, not all hotels displayed on Expedia.com are available through the Chase Ultimate Rewards travel portal. That’s because Expedia has different partnership levels which results in some hotels not being included with Chase. It’s best to search directly through Chase’s website to avoid disappointment. Previously, you couldn’t book more than ~9 months into the future when booking through the Chase Ultimate Rewards travel portal. But now, you can search for and book flights, hotels, rental cars, and excursions ~11 months in advance. This is a significant upgrade for folks with families or work/school limitations that require booking vacations well in advance. I’m excited about this change because it means we can plan holiday trips or complex vacations even farther ahead, ensuring we get the flights and hotels we need. This is a huge improvement in my book! Although the previous system would detail your flight time, aircraft type, and a few other details, the new Expedia-powered engine offers far more information about the specifics of your chosen flight. I Prefer to Learn About Baggage Fees in Advance! This is a big improvement, especially in the world of increased bag fees. By comparing the specifics of each flight booking, you get a better picture of your total “out the door” costs and can be proactive about avoiding airlines or booking classes that will charge significant additional fees depending on your baggage needs. Note: Unfortunately, you can’t earn Expedia Rewards when booking through the Chase Ultimate Rewards travel portal. Bummer! Theoretically, the new Expedia booking platform will provide access to flights on over 250 airlines around the world. This means that regardless of what flights you’re looking for, you should now have better access to booking those flights through the Chase Ultimate Rewards Travel Portal. But in reality, I can’t verify the addition of too many more airlines. There are a total of ~400 airlines in the world, but the average traveler has probably never heard of at least 350 of them. And with the frequent launching of new airlines (and acquisitions/bankruptcies of existing airlines! ), it’s hard to keep track! 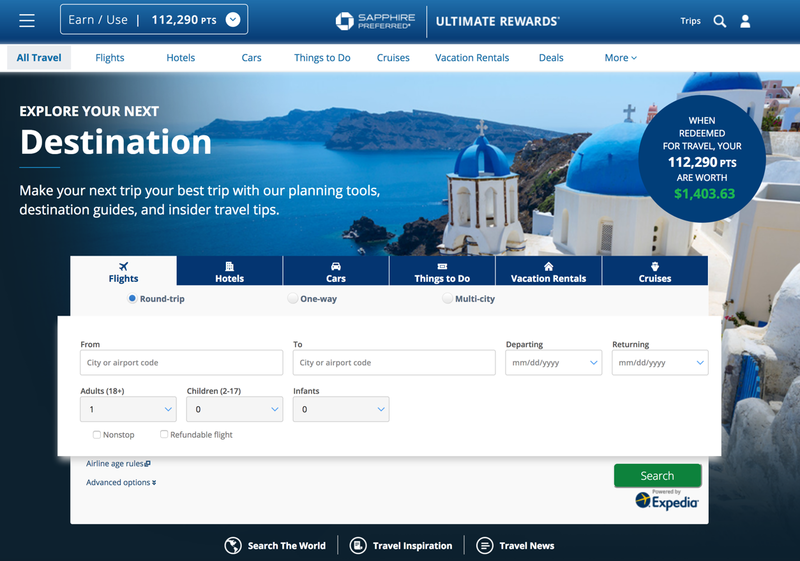 This is certainly a personal preference, but I find the new Chase Ultimate Rewards travel portal to be easier on they eyes now that it’s fueled by Expedia. The new landing page offers conveniences such as recent searches and travel inspiration (with amazing photos and destination descriptions) that are a step above what was previously offered. Note: The “recent searches” function will be a new favorite of mine – especially with how quickly Chase logs you out! I find myself logging back in many times, so I’ll make great use of this new feature to pick up my search from where I left off. There are also far more booking options, including vacation rentals and “Things to Do” which I found to be more extensive under the new portal. These are all minor usability enhancements, but I find the overall booking experience to be more pleasant on the updated Chase Ultimate Rewards travel portal. 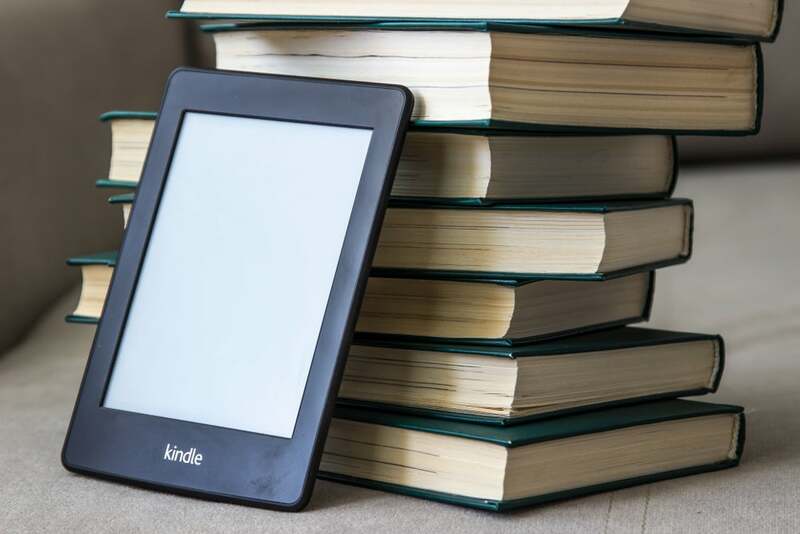 The overall number of airlines available might have increased, but the ability to book flights on Southwest and other budget carriers (such as WOW, Spirit, Allegiant, and Frontier) is currently unavailable. Because these airlines offer such competitive flight prices, it’s disappointing that you can’t book them through Chase at the moment. When chatting with Chase about this, I was told that they are still working on the integration and hope to provide access to booking on these airlines in the near future. I’m optimistic that they will be able to fix this or at least provide the ability to book over the phone, but only time will tell. In the meantime, if you want to book Southwest flights, consider transferring Chase Ultimate Rewards points to Southwest for an award flight instead. Note: The phone agent I got was wishy-washy on the airlines that weren’t currently bookable and if they would be bookable in the future. I plan to check back in a month or 2 to see if there has been more consistent internal training or communication on which airlines are included. Stay tuned! This is a trickier and more frustrating change. Flight prices in particular will sometimes vary between what is displayed on the Chase Ultimate Rewards travel portal and what you would pay when booking with the airline directly. In ~20 searches, I found only 3 instances of price discrepancies. On 2 occasions, flights were $10 to $50 higher on the Chase Ultimate Rewards travel portal than the fares I found on Google Flights. 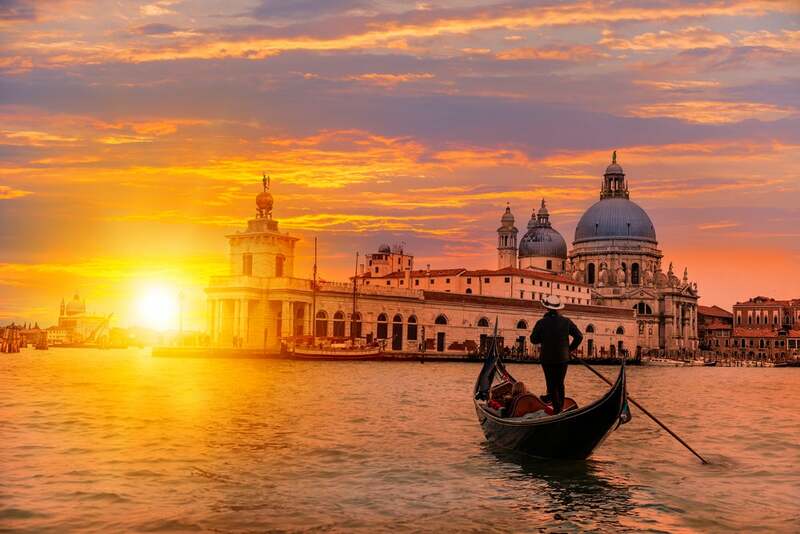 But one itinerary offered a $5 discount when booking through Chase! Even when comparing fare classes and digging into the fare rules, the same prices don’t always apply. This has been confirmed by a few readers and is a frustrating aspect of the new Chase Ultimate Rewards travel portal. 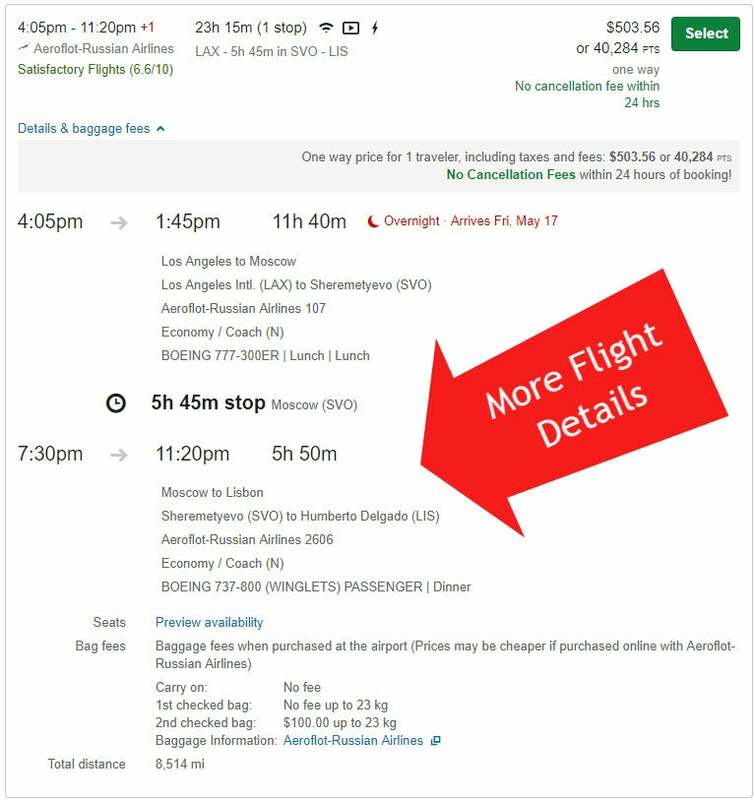 I suggest that you double check all your flight prices with the airline directly or with Google Flights before pulling the trigger on a Chase booking. Or, consider using a different bank’s travel portal to see if you’ll save that way. Historically, I haven’t noticed flight discrepancies when booking flights through the Citi ThankYou Travel Portal. Hopefully this is a technology glitch, but the rental car booking option is currently severely limited in the new Chase Ultimate Rewards travel portal. When searching for rental cars, you’ll often receive an error message that there are no available cars for your preferred location and/or time. Oh? No Rental Cars Available in Porto, Portugal? 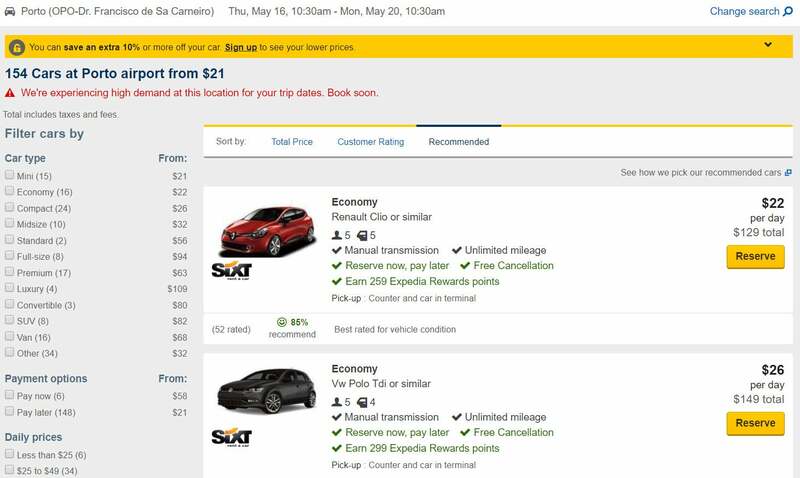 This is particularly frustrating, as the rental cars are most certainly available and list on the Expedia.com booking engine. For example, this rental car search in Porto, Portugal shows the clear discrepancy of what cars are available (or not!). Nope! Plenty of Cars Available. Let’s Hope This Glitch Is Fixed Soon! This is disappointing, and presumably (hopefully!) an IT error that will be rectified soon. Overall, I would call the update to the Expedia-powered Chase Ultimate Rewards travel portal a wash. The new improvements offered by Expedia are more or less cancelled out by ongoing IT glitches. On the other hand, I find the booking experience to be a bit more enjoyable, and as an aviation geek and travel enthusiast, I appreciate the additional flight and baggage details as well as the updated travel inspiration section. If Chase can work on the system limitations such as price discrepancies and lack of car rentals, I might call this “upgrade” a win. But until then, I’ll continue to redeem my Chase Ultimate Rewards exactly as I had before. That means I’ll transfer them to travel partners when it makes sense (for outsized value!) and I’ll redeem through the Chase Ultimate Rewards travel portal for 1.5 cents per point (thanks to having the Chase Sapphire Reserve) when looking for a simpler solution. Have you spent any time booking through the new Chase Ultimate Rewards travel portal yet? Has it been frustrating for you, or are you happy with the changes? I am very disappointed with the Chase Travel Portal since Expedia took over. I have racked up 500,000 + points with Chase credit cards and receive the so called 50% point bonus if I book travel through the Chase Travel Portal (Expedia) but each time I check the Chase Travel Portal, the prices are much higher than I could pay by just booking directly with the airline. Furthermore, my favorite airline is Southwest but Expedia can’t even book Southwest flights. So, I have found transferring my Chase Points to Southwest offers the most value. Particularly when Southwest usually values each point at about 1.5 cents anyway and sometimes even more! Thus I get the 50% bonus value anyway and don’t have to deal with Expedia ripping me off. Hi, Thanks for this article – very helpful. I’m sort of new to the portal thing, so apologies for the noob question: One thing that jumps out is the relatively limited flight options as compared to an airline’s own page. Comparing flights from ORD to Antigua, for example, over the same period produces 10 AA options on Chase vs. 40 on AA.com. Is this just a limitation of the Chase site that is remedied by speaking to a human on their toll-free, or are there simply fewer flight options? Thanks! So frustrated w/ the portal. Itineraries change in price during check-out, sometimes to the tune of $200! Go back to search page, same price. Go to airline website, same price. Go to Google Flights, same price. Try to check out with Chase? BAM, price jump! It looks like Spirit is still not offered – is that permanent? Will it remain the same that we will not receive credit from hotels (such as booking a night at Marriott thru Chase) but we will receive credit if we book a flight?